The Pyramids versions you have been playing up to now are quite short – only 16 bars long. To make the piece any longer without simply repeating the same music, we need a new, different, bit of music. This new material is called ‘the B section’ – just why is explained further on. It will make up bars 17 to 24 of our extended piece, which we finish off with our usual last eight bars. This gives Pyramids its final 32-bar AABA form. The 32-bar AABA chord structure is often used in popular song, especially jazz standards. Here is your lesson performance audio. Here is a sketch of the new music, made of the top (melody) and bottom (bass) notes. It’s good practice to learn these lines before you add the chords in. Here is a zigzag line diagram of this music. Try to play the top and bottom lines from the line diagram, too. Now add in the left hand chords only. You see immediately that there is one non-BMP chord in the left hand – the D sharp diminished chord in bar 22. It’s explained in full further on in this module. You can read the left hand notes or get them from the MIDI performance, or copy the 'L' notes from this keyboard diagram. The right hand has to play chord tones as well as melody notes. If we add those right hand chord tones in, we get this diagram showing all the elements of the new ‘B section’ music. The stems-up notes in the treble clef are the melody notes. The stems-down notes in the treble clef are the right hand chord tones. 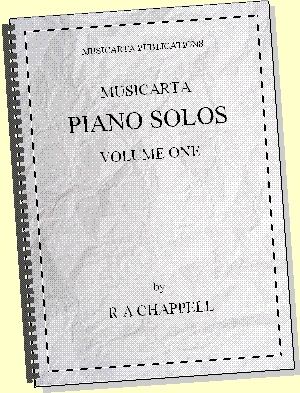 Most of them are plain Basic Music-making Position (BMP) chords, in spite of the more complicated chord names. 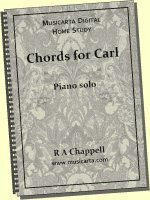 Here is a video work-through of just the chords. The simplest B section performance looks like this. As before, play six rising BMP notes according to the chord symbol. 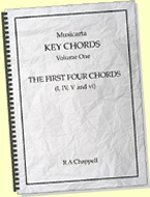 Even the F major 7 and the E minor seven chords have these six simple notes – the names are only complicated because the new melody note is not a BMP chord tone. The three-note chords which are not simple BMP chords are circled in the music above, and you can find these chords in the diagrams which come next. 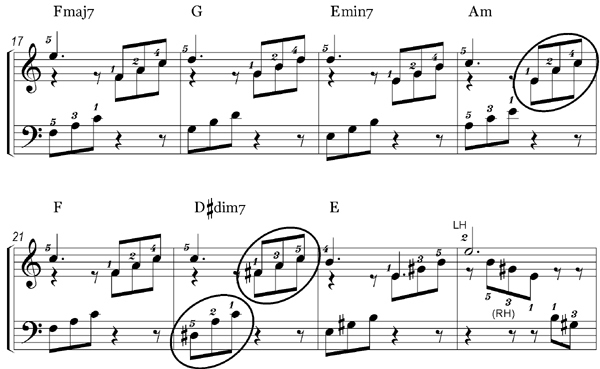 Otherwise, you can see that the pattern is the same as before: one melody note at the start of the bar, and six rising (left hand, right hand) BMP chord tones. 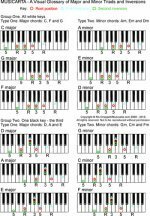 Here are keyboard diagrams and audio/MIDI clips for the more complex chords. The added note E, the seventh note above the root F, gives this chord its name. The added note D, the seventh note above the root E, gives this chord its name, but the chord is minor, hence ‘minor seventh’. Note that the hands share the E in the middle of the chord and the right hand is playing an inversion of the A minor BMP chord. All the notes of a diminished chord are spaced a minor third apart – but you do not have to use all of them. The two halves of the Pyramids 16-bar chord sequence – the versions you have been playing so far – are the same apart from their endings. Music textbooks would describe it as having “A-A” form, or more precisely, “A1A2” form, because the halves end slightly differently. The new, different section of music needed to make the piece longer is called the “B section”. 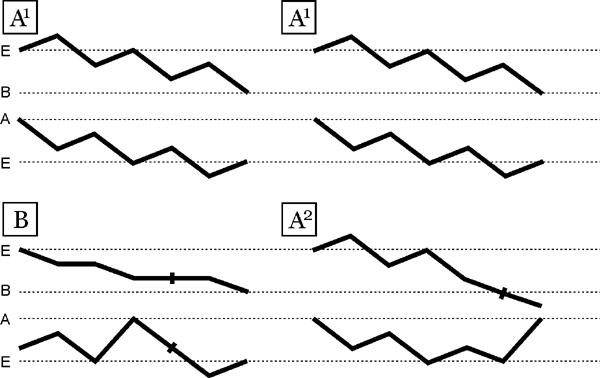 ‘A’ and ‘B’ have nothing to do with the notes or chords A and B, but are only used to stand for eight-bar sections of music that are either the same (like A1 and A1) or nearly the same (A1 and A2), or different, like A and B. We are going to make Pyramids twice as long by playing four 8-bar sections of the chord sequence in this order: A1, A1, B, A2. This structure is usually just called “AABA form” – you say just the four letters names, “AABA” without the numbers. In the new 32-bar Pyramids ‘AABA’ piece, the second 8-bar section is the same as the first – otherwise the piece would end at bar 16. The slightly different eight-bar A2 section is saved for the real ending. Here is the full 32-bar chord sequence. If you can play the basic B section music from the instructions so far, you can slot it into the music you already know (rearranged) and play a 32-bar version of Pyramids. 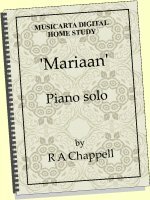 You play the first half of our familiar 16-bar version (A1) twice, the new (simple) B section music (page 4XX), and the second half of the 16-bar version (A2). The melody in the new B section now needs to be developed to match the developed melody in the rest of the piece. 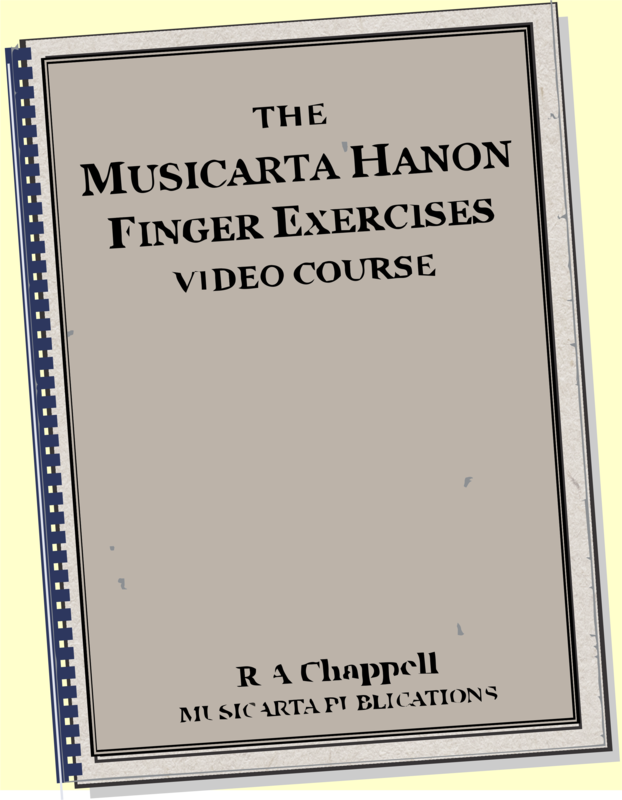 Just as in Lesson Five, we squeeze third or fourth fingers in to make little runs of notes. The third finger is squeezed in bars 18, 20 and 21, going up. The fourth finger is squeezed in bar 22, coming down. There is a repeated melody note across the bar line three times (bars 18/19, 20/21 and 21/22). Use different fingers – RH4 and 5 – for the repeated note. Watch for the thumbs playing the same note E in bar 20, where the right hand plays the second inversion A minor triad. 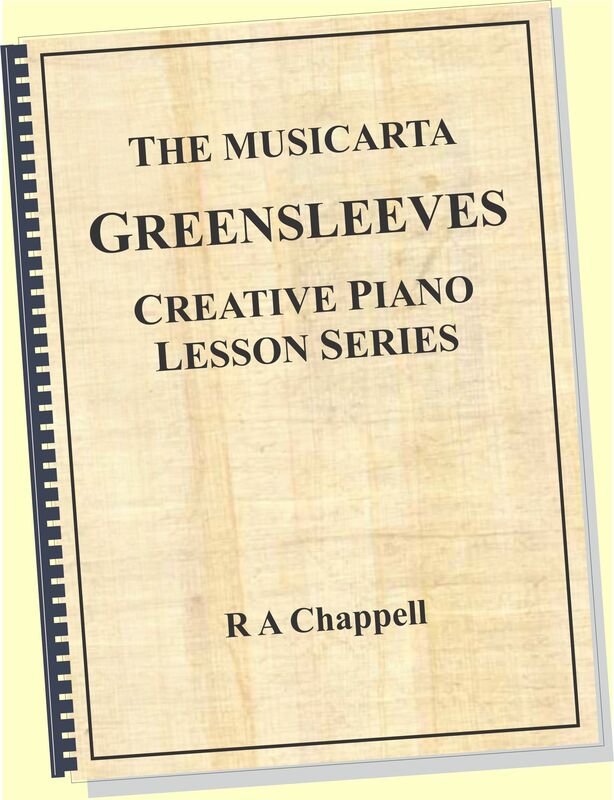 The music for the Pyramids 32-bar AABA Form performance is in the Workbook, but try to play the 32-bar Pyramids version from the more creative non-manuscript build-up in this lesson. Here is a MidiPiano/Piano Roll pane performance of the developed-melody B strain. 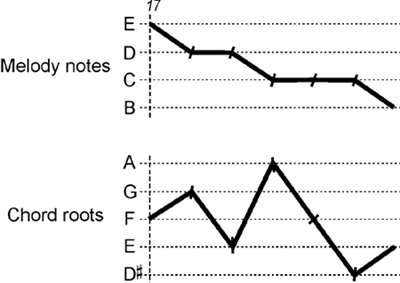 Here is a melody note/chord root zigzag line diagram for the full 32-bar Pyramids AABA version. Study it to get an overall view of the 32-bar form. It will help you keep your place when playing the longer version. Here is the MidiPiano/scrolling MS performance. 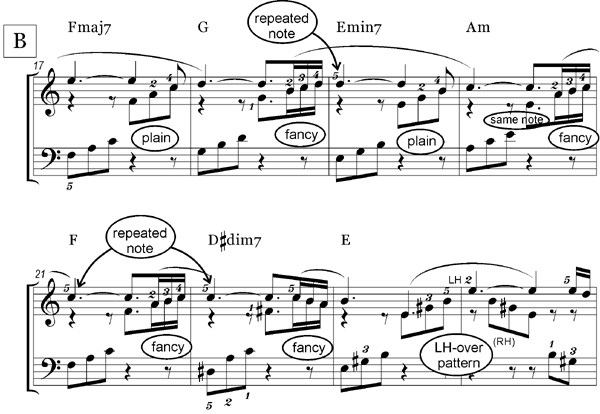 The AABA structure is often used in popular song, especially jazz standards. Listen out for it in instrumental pieces and songs. Now go on to Lesson Seven.